Antisocial behavior is categorized as not wanting to be around others, but it can feel like more than that, and it could be the result of a deeper, more spiritual problem. Antisocial behavior is categorized as not wanting to be around others, but it can feel like more than that. Maybe you feel like you don’t derive satisfaction from interacting with others or forming relationships with people. Maybe you feel like people don’t understand the real you, which makes it almost futile to create lasting connections. You may even feel like you care about people and relationships so much that becoming involved ends up being more of a burden than anything else. If this describes how you’ve been feeling lately, it could be the result of a deeper, more spiritual problem. The heart chakra is the fourth chakra, and it’s located directly in the center of the chakra system. It exists between the breasts in the middle of the chest, which represents expressions of compassion, love, and how we relate to ourselves and others. 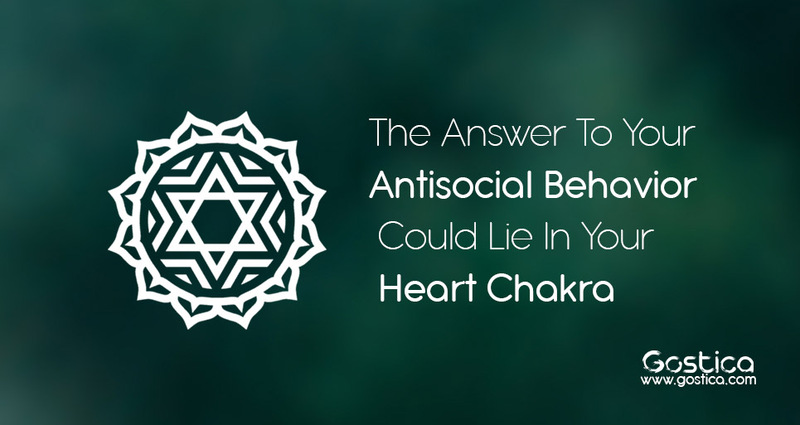 A block heart chakra absolutely results in antisocial-like behaviors that can start to tear a person away from their relationships. The literal translation of heart chakra from the traditional Sanskrit is Anahata, which means unstruck. It’s easy to deduce that by balancing your heart chakra, you will feel freer and allow yourself to open up to others. In sense, you will become “unstuck” in your social life. Essentially, the heart chakra is our pathway to creating lasting, emotional, and deep connections with the people around us. It actually blends the functions of all the other chakras together and therefore is arguably the most important. When the heart chakra is balanced, it balances all the others as well, which means a healthy, happy life. When the heart chakra is blocked, you need to be able to identify the issue so that you can bring your world back in balance. It’s important to note that these symptoms don’t always occur when your heart chakra is blocked, and you may experience more than what’s listed above. It’s also important to note that there are two clear extremes: you’ll either feel complete isolation from other people, or you’ll become so dependent on others you’ll lose yourself while seeking their approval. Try getting rid of as much stress in your life as possible in order to clear your heart chakra, as well as attempting to heal from the emotional pain. Holding on to emotional pain from the past is one of the most common ways to block your heart chakra and stumble down a dangerous path. Learn to let go in order to open up.